April 21, 2011 December 4, 2013 cooksomethingrva! When growing indoors, it’s best to plant herbs with like sunlight needs. This information is commonly found either on the seed packets or on the plant stakes in the seedling container. Again, I have to say that I have the best results when starting with seedlings , but you may prefer to start from seed. I use a rich organic soil and plant in medium-sized pots since the herbs have some serious roots that like to spread out. I am partial to clay pots, but with clay pots you need to water a little more frequently than with plastic or glazed ceramic pots because the clay absorbs the water. Lowe’s, Wal-mart and Southern States all have a good selection of organic soils to choose from and varying price ranges. You may want to also consider a good organic plant food to supplement the nutrients that these plants would normally draw from the ground soil. 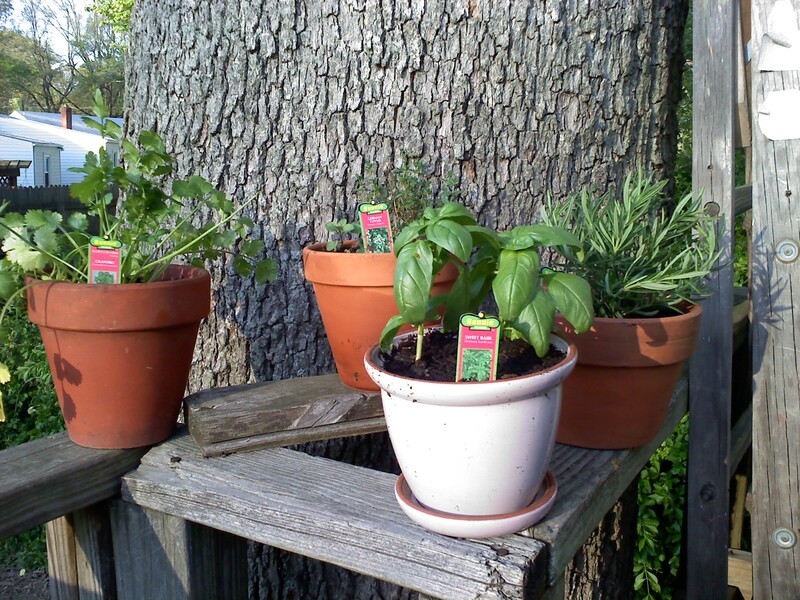 I use Miracle-Gro Organic Potting Soil and Plant Food. I have gotten really great results and this brand is very affordable and easy to find. Placing about 2-3 inches of soil in the base of your pot, place your seedling on top and fill in with soil. Soak your plant with water and let soil dry a couple of days. This will depend on the amount of light the plant requires. Easiest way to determine if your herbs need watering is to put your finger into the soil to feel for moisture. Mix your plant food with your water for your second watering. I only add plant food to the water once a week.